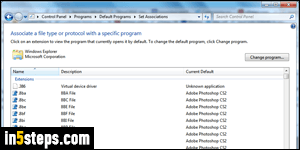 When you set your default web browser in Windows 7, this means that the program you select handles some or all features it can handle. For browsers, this includes opening HTML files, web-specific image formats (GIF, JPG, PNG, WebP), and various web protocols (HTTP, HTTPS, FTP, and MAILTO for email links). 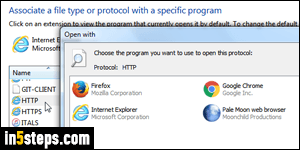 But I'll show you how to use two default browsers in Windows 7: one that handles protocols (e.g., when you click on links in emails), and one that handles everything else. 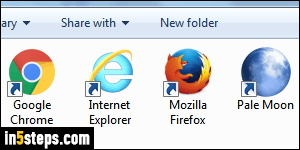 You can always restore everything back to one browser. Let's start by launching the Control Panel: open the start menu, and type "default" in the search field. 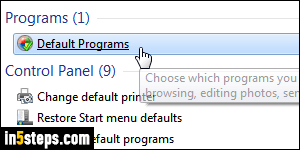 Click on the Default Programs link at the top. The first link on that screen ("Set your default programs") is the way you'd associate a web browser with everything it can handle. 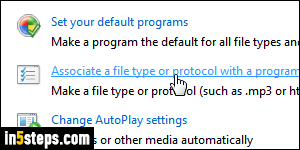 In our case, we'll click on the "Associate a file type or protocol with a program" link instead. Depending on your computer's speed (CPU and hard drive), and on the number of apps you've installed, the list of file types and protocols may take a while to load. Once done, scroll down to the very bottom: that last section contains all the protocols Windows 7 recognizes. Unlike file extensions, a protocol defines how you'll receive or launch the file, nothing about the file itself.